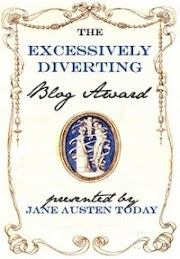 A selection of articles on history, politics, art and literature. American blues singer Greg Brown has a song that has the refrain "I'm a man that’s rich in daughters." A friend gave me a copy when my third daughter was born. I was reminded of this recently when I was in Berlin for the weekend. Although I was at a conference all day long, it turned out that the Saturday night was The Long Night of the Museums, so I headed down to Museum Island. The atmosphere was relaxed, with Berliners of all ages dancing on the banks of the Spree while hundreds sat in deckchairs drinking wine and beer as the Berlin Chamber Orchestra played a free concert outside the Museum of Ancient Art. I enjoyed the ambiance, but I was on a quest, and so I joined the line for the Egyptian Collection in the Neues Museum. Classical columns still bear smoke damage. The collection from the Amarna period of Egyptian history includes a number of stunning masterpieces. Most people crowd into the dark room that hosts the famous bust of Nefertiti. She sits in a glass case alone in the centre of the room. People stand in a circle and gaze reverentially at her beauty.A hushed silence reigns, broken only by the harsh outbursts of a guard "No photos!". This is art that is put on a pedestal, metaphorically as well as literally. I have an uneasy feeling that I've joined with a number of strangers in some fetishistic activity, a confirmation that the museum has replaced the church in contemporary European life. The object of our adulation might be three and a half thousand years old, but she looks like she belongs in a fashion magazine, or at least could be strolling the streets of Berlin. Being a bust though, obviously that would be difficult. 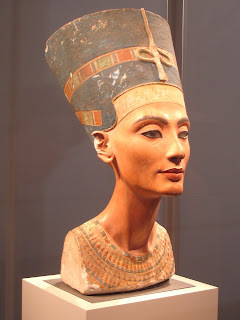 But dare I say it, and I don't mean this as an insult to anyone, living or dead, but it strikes me that Nefertiti might be the best looking person in Berlin. However, on this night I wasn't interested in Nefertiti alone. I was looking for her and her husband, a man like me, blessed with daughters. And there, in a little alcove, almost hidden away, I found what I was looking for, a relief depicting the Pharaoh Akhenaton and his wife Nefertiti with three of their five daughters. It is a scene of such unbelievable poignancy, that on this night, alone in Berlin, far from my three daughters and their mother, I feel a connection with this portrayal of simple domesticity. Egyptian art has a certain timeless quality, not least because its stiff portraits followed a formula that remained the same for thousands of years. But this small stele, probably made as a household shrine, with is curvilineal forms, is anything but stiff and doesn't strike me as being formal at all. This is a glimpse of an intimate scene of familial love drenched in the rays of the sun god. The pharaoh, Akhenaton, sits on the left, raising his youngest daughter to his lips, as he gazes downward in an expression of fatherly love. See how his left hand protects her head while his right hand, with its long slender fingers, tenderly supports her thigh. His wife, Nefertiti sits on the right, with a second daughter leaning against her shoulder. The child's right hand might be pointing at the sun, but I like to believe that it is brushing her mother's cheek, while her left arm drapes casually over her mother's shoulder. The third, older, daughter sits on her mother's lap, pointing towards her dad with her right hand, while her left hand rests in her mother's hand and her face is turned upwards towards her mother. "Look mum", she might be saying, "daddy is kissing the baby". This might be one of the greatest works of art ever made, but is a scene that, on this beautiful late summer evening, I find it easy to relate to. I think it speaks to all men blessed with daughters. This work by Paul Doolan is licensed under a Creative Commons Attribution-NonCommercial-NoDerivs 3.0 Unported License. reminder: Alberti's Window has moved!